Brenda Strong Frazier (b. 1941) was born in Shelby, North Carolina, the oldest of eight children. The family moved to the Pittsburgh region in 1943. Her father worked in the steel mills during World War II, then worked on the railroad and later opened a dry cleaning business. They lived in segregated public housing project in Whitaker, a town in the industrial valley near Pittsburgh. She graduated from Homestead High School, earned a bachelor’s degree from Indiana University of Pennsylvania and became an elementary school teacher in Pittsburgh. In 1969, she married Andrew Frazier, also a Pittsburgh public school teacher. They have three children Andy Jr., Evan and Jenny. Brenda’s aunt was head of her local NAACP in New Jersey in the 1940s and 1950s and became an early role model. Visiting her during the 1940s and 1950s, Brenda saw people treated more equally than in Pittsburgh and heard stories of how to move the agenda for black people. This experience taught Brenda that you have to break down barriers to injustice if you want to change the system. She became an activist in college, participating in sit-ins at segregated restaurants near campus and the first civil rights march in Washington, D.C. in 1963. Then, she became active in the teacher’s union in Pittsburgh. Brenda and her husband helped to integrate a white neighborhood in Pittsburgh so their children could attend the best schools in the city. A neighbor recruited her to the First Pittsburgh chapter of the National Organization for Women (NOW) in 1975. Brenda was very interested in the issues NOW was addressing, but she said “I didn’t want to stop fighting racism to fight against sexism” (Frazier, 2008). She took the message of fighting both racism and sexism to PA-NOW and national NOW. In 1977, she and Carol Titus founded East End NOW with by-laws requiring co-presidents, one African American and one White, which became a magnate for African American feminists in Pittsburgh. Members of East End NOW organized a conference on Racism and Sexism in Pittsburgh and successfully lobbied for national NOW to adopt a resolution insuring that African American women would be represented on the board. Brenda was appointed co-chair of NOW’s Minority Women’s Committee and took the message of the women’s movement into various minority communities – Black, Chicano and Native American – across the country. She served on the boards of both PA-NOW and NOW. 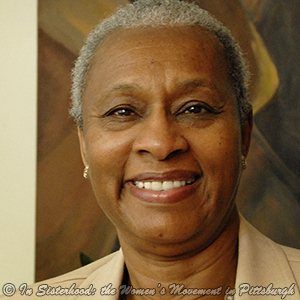 Ms. Frazier was elected to the Allegheny County Council in 2001 and re-elected twice, in 2004 and 2007. She resigned her Council position in 2008 to run for a seat in the State House of Representatives, loosing the election by a slim margin. She currently serves on the Pennsylvania Democratic Committee where she started a black caucus to give voice to the concerns of African Americans in Pennsylvania.